Because SquawkGear is a bridge between FlightGear and SB747, it does not have a user interface of its own. You can interact with SB747 using its own window, or using the FlightGear interface described below. This interface is intentionally quite similar to FlightGear’s own multiplayer chat. Clicking on “Direct Comms” will pop up a chatbox similar to FlightGear multiplayer chat; I changed the colours to make them distinguishable. Direct Comms is used for private messages with individual users on VATSIM, whether ATC, pilots or observers. Fill in the callsign of your intended recipient in the little box at bottom left, then type your message in the longer box to the right. If Direct Comms is not open, you can view incoming private messages in two ways: 1. for a brief moment the message will be printed near top of FlightGear screen, 2. check the SB747 log window, or the SB747 direct communications window. For an open transmission on the active COM1 VHF frequency, use the FlightGear messaging prompt: press the underscore key (“_”, Shift-Dash) then compose your transmission. Everyone who is tuned into the same frequency and who is within radio range can read your transmission, so please observe standard radio decorum ! Notice that the text I typed appears in red in the first line, prefixed by my callsign (“9V-SMP”). 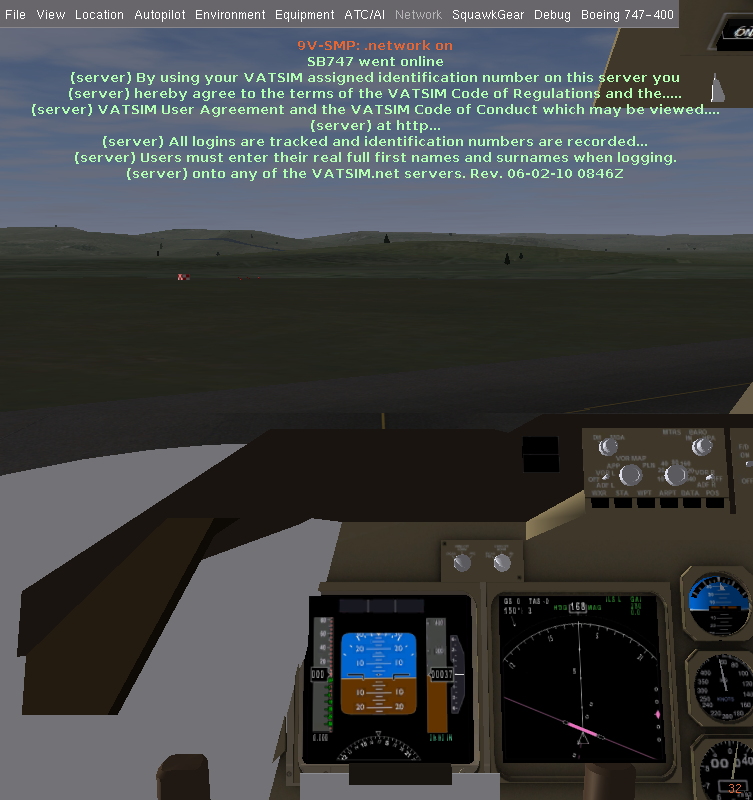 The VATSIM server’s response (as well as all open communications) is printed in pale green by FlightGear. In the above example, there are 3 controllers within radio range: WSSS_APP, WSSS_ATIS, WSSS_GND. (Note that SB747 changed the underscore to a dash.) Assuming you want to request airways clearance, you should tune COM1 to 124.3 MHz to contact Singapore Ground. Your airways clearance will include a squawk code. This is a 4-digit code that you dial into your aircraft transponder. Most FlightGear aircraft do not have a transponder panel, so I have added one to the usual radio tuning dialog. When on the ground, squawk ‘standby’ (ie ‘0000’) so that you don’t clutter up the controller’s radar screen. (This ought to be automated in future.) Squawk your assigned code as you taxi to the runway for take-off. I’m getting closer to getting this all to work! I am successfully recieving and sending chat messages through Vatsim. It seems like everything is working, but when I ask the controller if they have me on radar, they say negative. However, on Vatview.com, I can see myself. Other than not being on radar, my voice seems to not work. I can hear them perfectly through AVC, but they can’t hear me. My PPT key is Left-Control, but it seems to not work. I did tested my mic with the AVC voice test, and everything is loud and clear. However, no one on the other end can hear me. I only can hear them. Do you have any ideas why? I’m on Linux Ubuntu. My advice is if your PTT isn’t working, switch to another button and try that. And too, not all controllers will see you on radar. First, in order for ATC to see you, you MUST first file a flight plan. This can be done any number of ways, but my favourite is to use simroutes.com, file online using it, then submit from the window to which filing online takes you; it’s a two-step process. Be sure also to click Squawbox 2 on the dropdown which says “FS9”, on the right towards the middle of the form. Then, load up SqG, your flight client, SB747 and AVC in that order, find your closest ATC, ask for radio check. That is the proper procedure to contact ATC. They well tell you if they can hear you. Once you’ve established contact, then proceed with your flight. It is an ATC phrasebook which I found very helpful in dealing with ATC on VATSIM. I’m running on PCLINUXOS which is quite close to your ubuntu, so it should work for you if you try it this way. Good luck. I tried Left-control and Space, but both seem to not work. Trennor, what PPT key are you using? I’ve used both the default (space bar) and left-shift keys, but almost anything will work, even one of your mouse buttons if you prefer. Right now I’m back to the space bar. I am trying to find squawkgear. The links does not work. Anyone can help?